We are painting!!!! 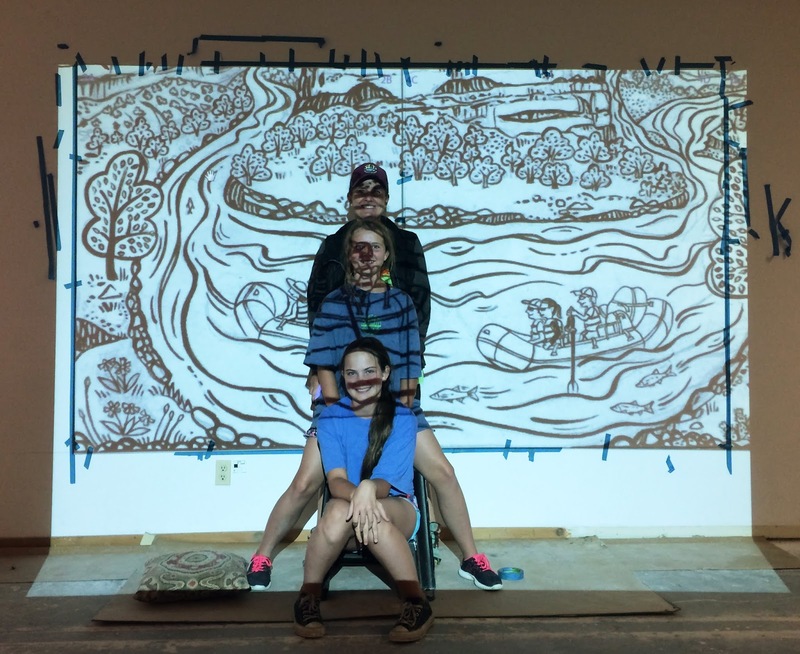 I've been so busy I haven't posted, but lots of progress has been made on the mural. I want to share the online sign-up form if you'd like to come and help. I'd also like to let you know that we are still doing fundraising to get the mural completed and Friends of the Yampa has a lovely informational page if you'd like to donate or share it with friends. They only have 2 framed original linocuts of mine left if you'd like to donate $2000 and receive one as a reward. These prints were created by hand- first I carved the block, and then inked and printed it. 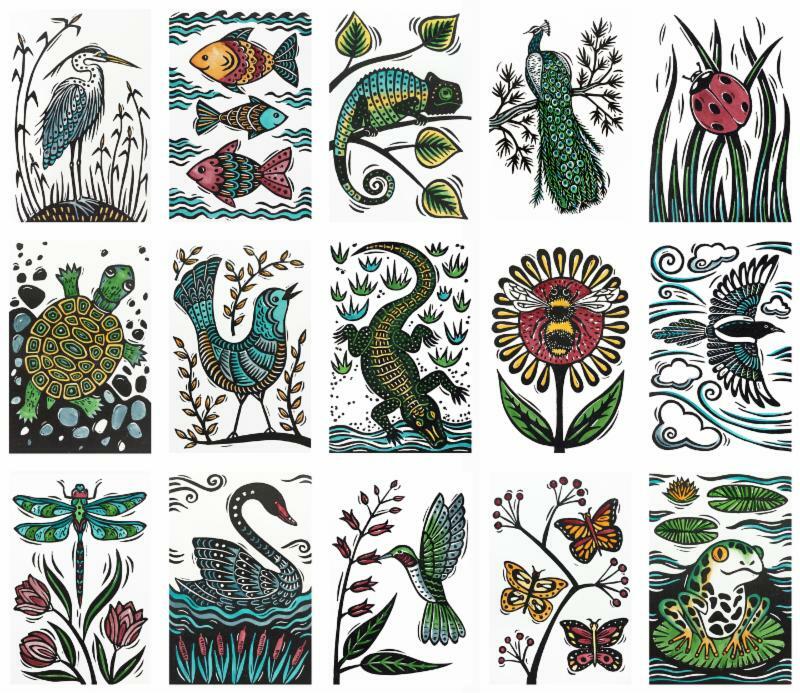 Next each black and white print was painted with watercolor. And they were framed beautifully by Steamboat Frame Works. Friday September 7 we are celebrating our volunteers and our progress with a party! If you can stop by to see our workspace and what I've been up to, I'd be really happy to see you. In Steamboat, head toward the Ski Area, turn onto Burgess Creek Rd and take the first right into a parking lot. Drive around the lot toward the front or side of the Clock Tower Building and park- don't worry about the No Parking signs, that's just for the winter. Walk down the pavers, not up the stairs. We are in the basement and will have snacks and drinks. Now to the good stuff- Here are a bunch of photos, from the beginning to our progress so far. It's exciting! 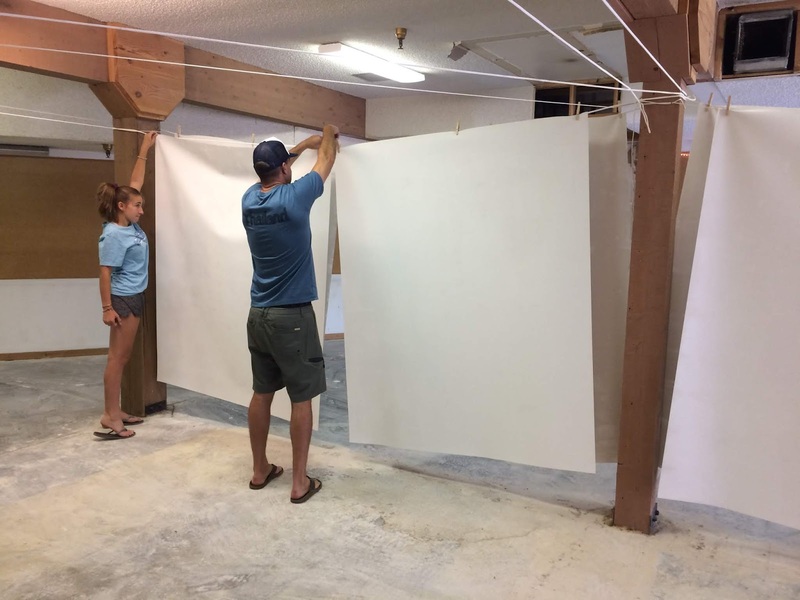 Our workspace with my daughter standing in front of the roll of polytab that the mural will be painted on. Join us on August 19th, 10 - 4 pm! 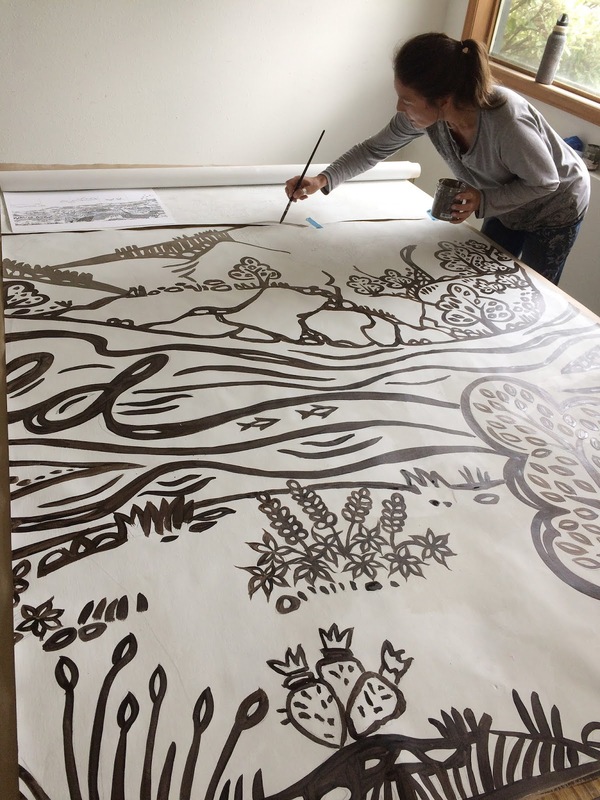 Local Steamboat Springs artist and printmaker, Jill Bergman, will be guest instructing our Studio Sunday workshop. 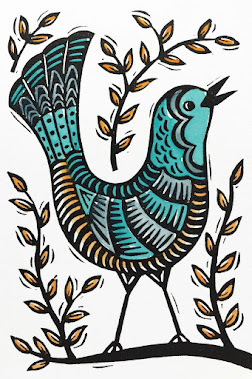 She specializes in linoleum block printing, often painted with watercolor, in her distinct, whimsical style. Her blocks are carved with delicate lines and exquisite detail. 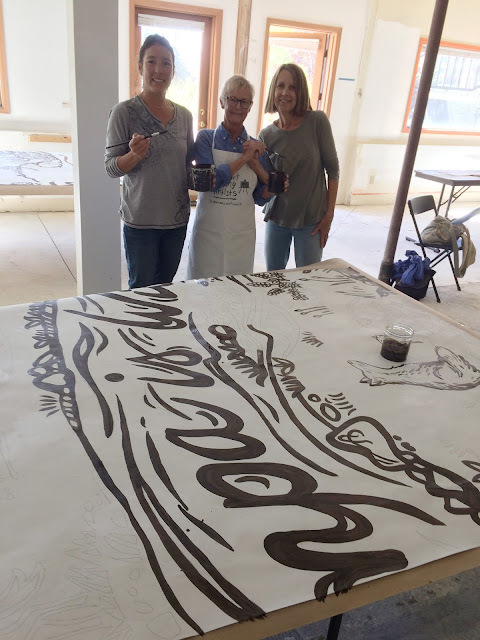 Along with master printer Susan Oehme, she will teach block carving techniques and assist students in bringing their images to life through the block printing process. The class will be held on August 19th, from 10 - 4. 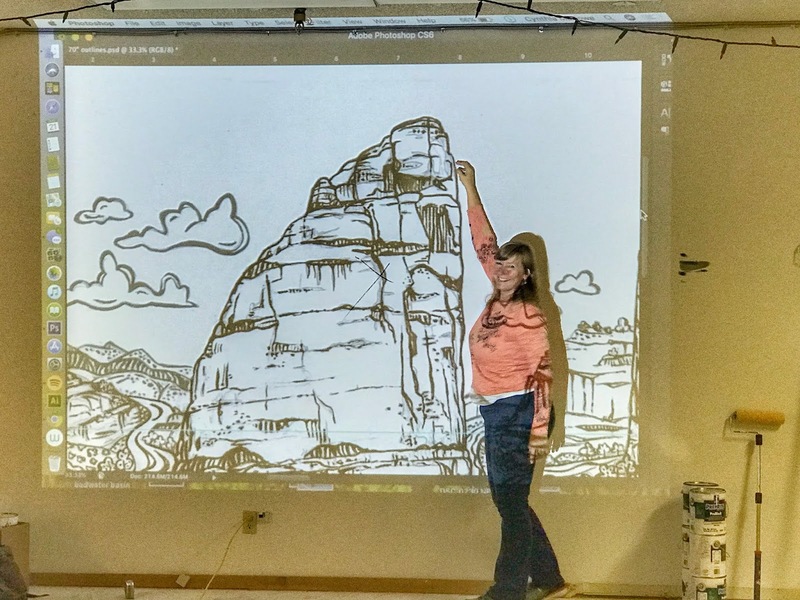 Students are encouraged to bring a sketch of the image they want to create or at least an idea. 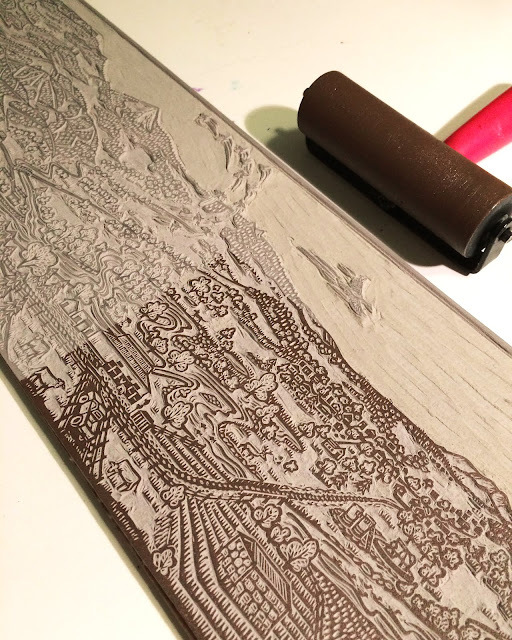 We will be working on 9 x 12 blocks, printed with oil based rolled ink. 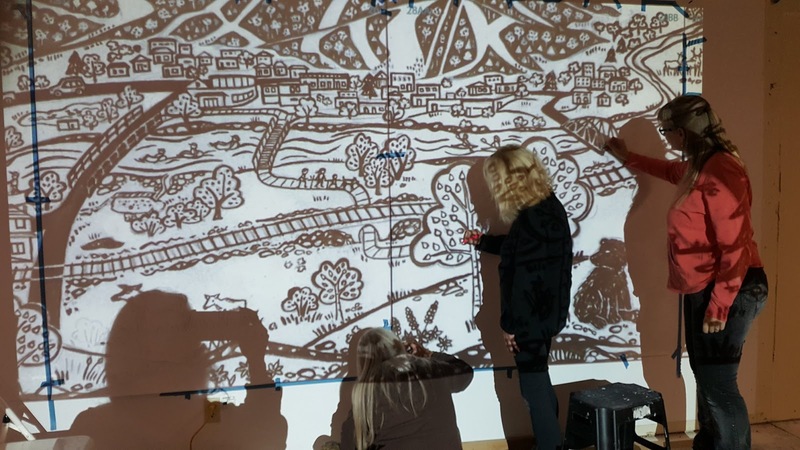 The cost is $100, which includes your block, inks and 2 sheets of paper. For this class we're expanding the enrollment to 10 students. As always, bring a packed lunch and a creative spirit! I love the feeling of being outside in the breeze, by the river, with trees and mountains around. It’s both peaceful and exciting. Being near a big river gives me a feeling of adventure, like the river is flowing past to places far away and it could lead me there too. It also feels like a sanctuary. Because we depend on water just like the animals and plants do, being next to a river is reassuring. The river may be frozen, low water, or flooding its banks, but it’s always there providing water, which is something we shouldn’t take for granted. 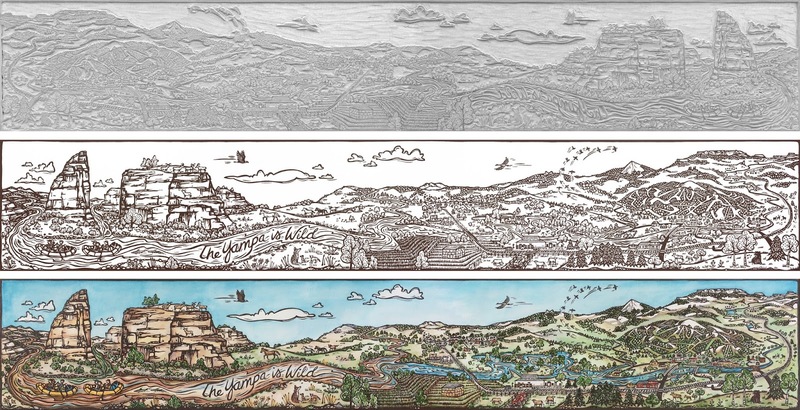 Because of the mural, I've been studying photos of the river landscape for quite a while. Where the Yampa meets the Green River in Echo Park is an amazing place and my family got to go there and camp about a week ago. It was fantastic! Here are a few photos. You can just see the green color of the Green River where it meets the brown Yampa below the rock wall where it looks like there is a shallow amphitheater. 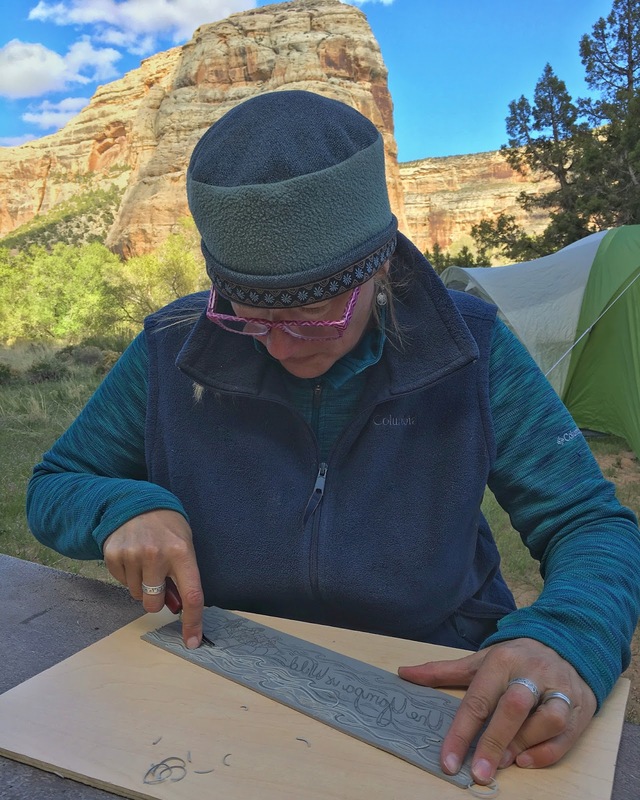 Here I am carving a little print for the Friends of the Yampa in the campground below Steamboat Rock. They asked me to do the artwork for the t-shirts and poster for their River Festival coming up the end of May. I tried to make it similar to the style of art I used to design the mural, but better suited to printing on a t-shirt. Here's a peak at how it turned out! So, here's to celebrating our Wild Yampa River during it's spring high water season!! It's officially spring, but spring in the Rocky Mountains still includes some snow. 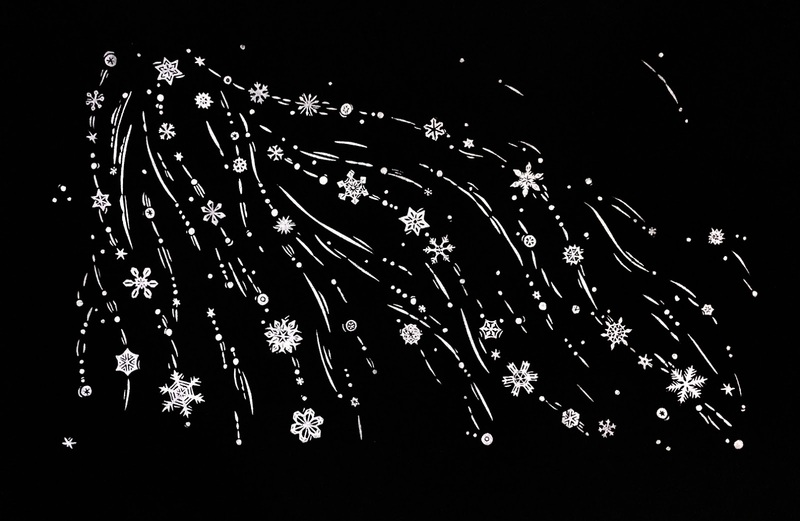 And I managed to finish up this block of snowflakes and print it while we were still getting a bit of snow. So I feel sort of seasonally appropriate! I've also been overhauling my website, www.jillbergman.com. Every page is updated and I put these new black and white prints on the opening page, they look really great all together! For almost a year I've been slowly changing my focus artistically. Before that, most of my energy was directed at children's illustration. 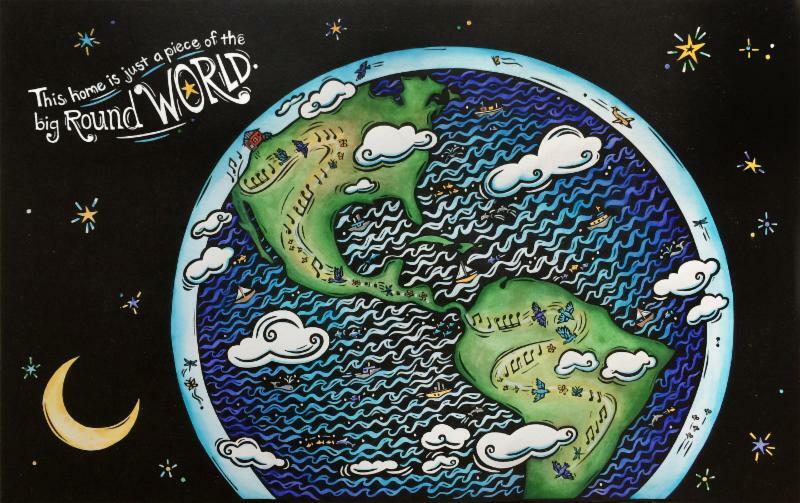 I still love picture books and illustration, and I still intend to finish my book, Our Home. But opportunities kept coming my way for other types of illustration, commissions, and fine art. I'm enjoying creating a little more graphic style work lately with pattern and design like these recent prints with white ink on black paper. I'm very interested in doing commissions and I've made a page highlighting some favorite projects here. You can comment over there, it's set up like a blog, and it would really help me out if you'd like to leave a comment! 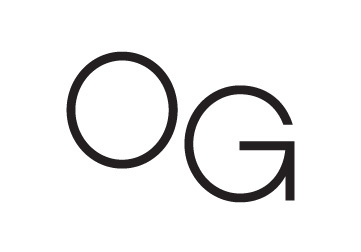 Please also get in touch if there is a project you'd like to talk with me about doing for you or your business. Also in the spirit of a fresh new art business, my website shop is newly stocked, very full, and I have a discount code for 25% off for the month of April, 2018!! Please email me jill@jillbergman.com and I will send it to you. Or comment here with your email and I'll send it your way. Happy art and happy spring, whether that means snow or sunshine! It's spring and time to think about planting... and I've been thinking about planting trees! 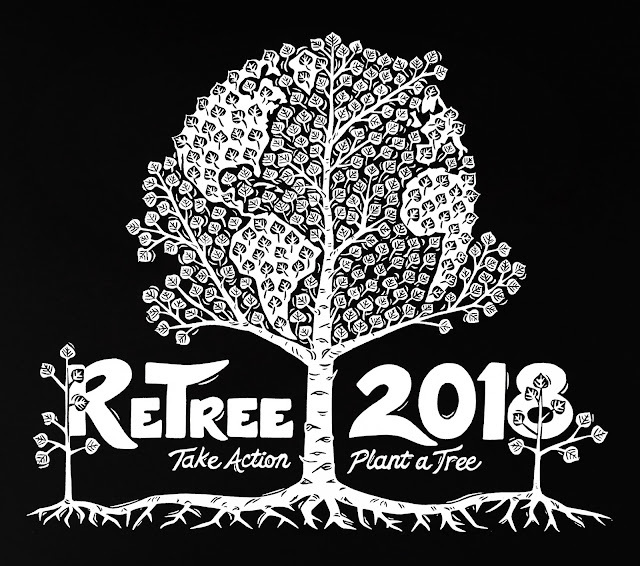 I'm making a t-shirt and poster design for ReTree Steamboat again. This is a program that I really love that's put on by the Yampa Valley Sustainability Council. There will be a tree potting event in May and planting will be in the fall. For the past couple of years we planted trees along the Yampa River to help protect the river channel and restore animal habitat. If you are in Steamboat, I hope you can volunteer and come plant trees with the community! The t-shirt will be printed with light colored ink, so I used white on black paper for my print. And I got to paint with color for the poster. I like this brown version because it's a little different for me. I don't use colored paper for printmaking very often, but brown, blue and green are the perfect earth and tree colors. 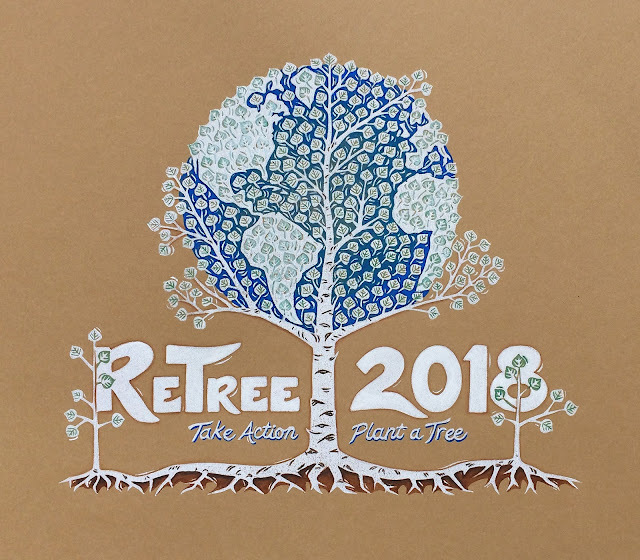 Take action, plant a tree! 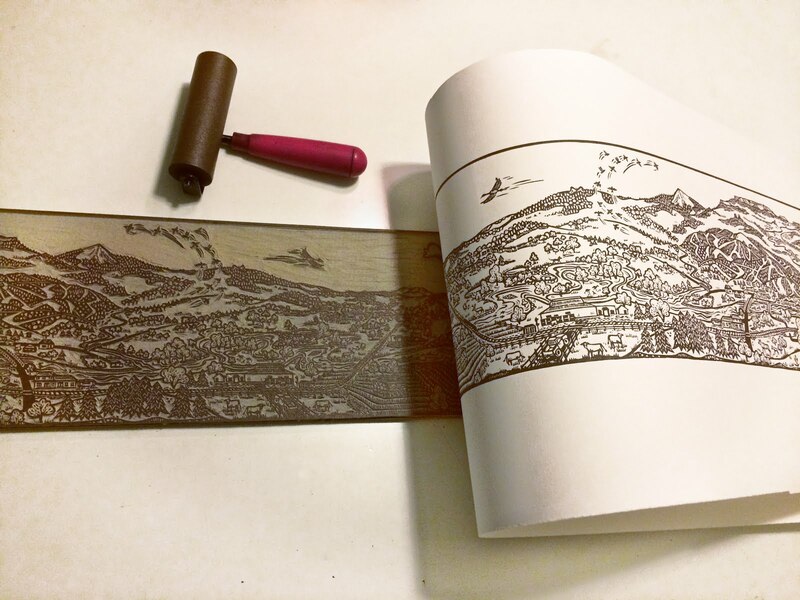 The Yampa Print is Done! And I know you have all been holding your breath.... so here it is! 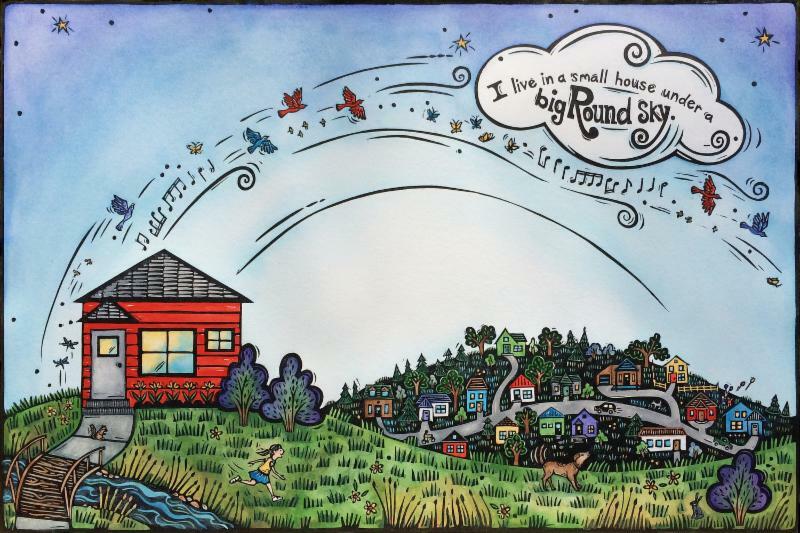 I'm going to create a numbered, open edition of this print and donate the first three to Friends of the Yampa to help with fundraising some more money for the mural. So if you are interested, please contact them! After that, I'll have some for sale through my website, www.jillbergman.com. And we will also be creating poster reproductions that you'll be able to get through my website. I'll be splitting the proceeds from all poster sales with Friends of the Yampa to support this mural, and also future projects of theirs. I'll let you know when everything is ready! 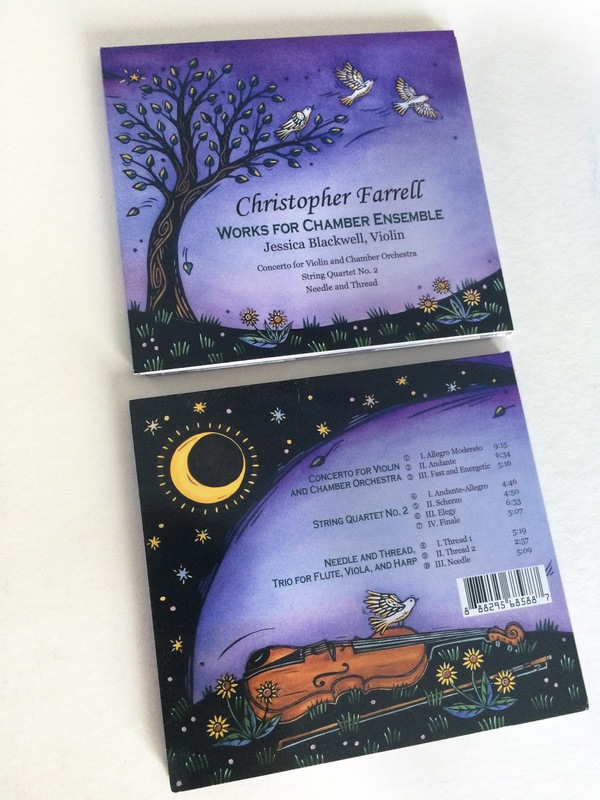 Last summer I created the artwork for my friend Chris Farrell's new recording of classical compositions. I've always wanted to make an album cover and it was as fun as I thought it would be! 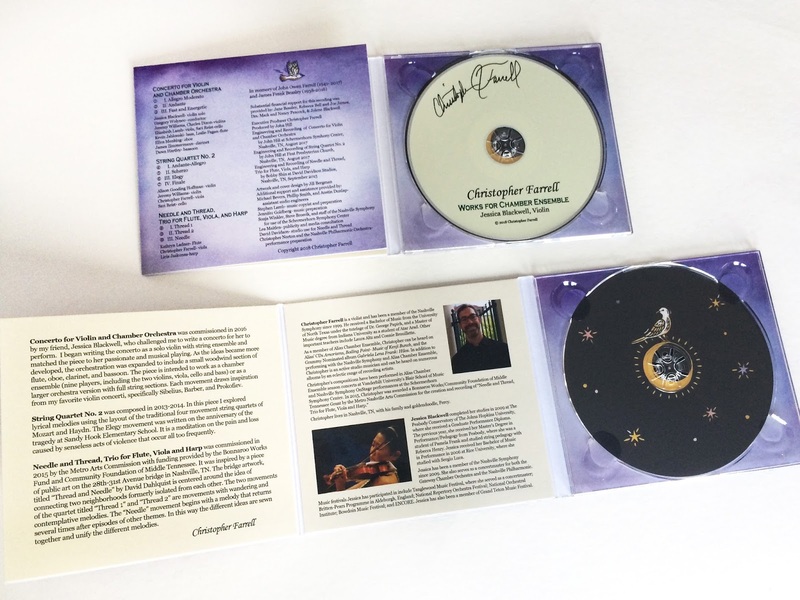 Then it took time for him to record and process the music, and in December I did the layout for the entire cover. Here's how it turned out! It took a long time, but this Yampa River block has been carved and printed! I wanted to share some process photos and after it's been painted I'll post pictures of the final print. If you follow me on Instagram, I've also shared lots of videos of the carving and printing over there. Above is the Little Snake River flowing into the Yampa with a tiny little heron standing on the sandbar. And here are rafters floating past Steamboat Rock at the confluence with the Green River. I grew up rafting, but I've never been here. 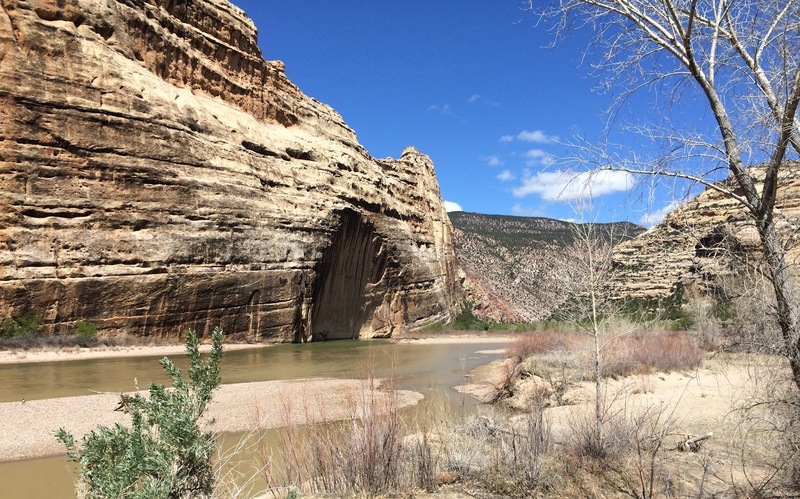 I'm planning to visit this spot in Dinosaur National Monument this spring. 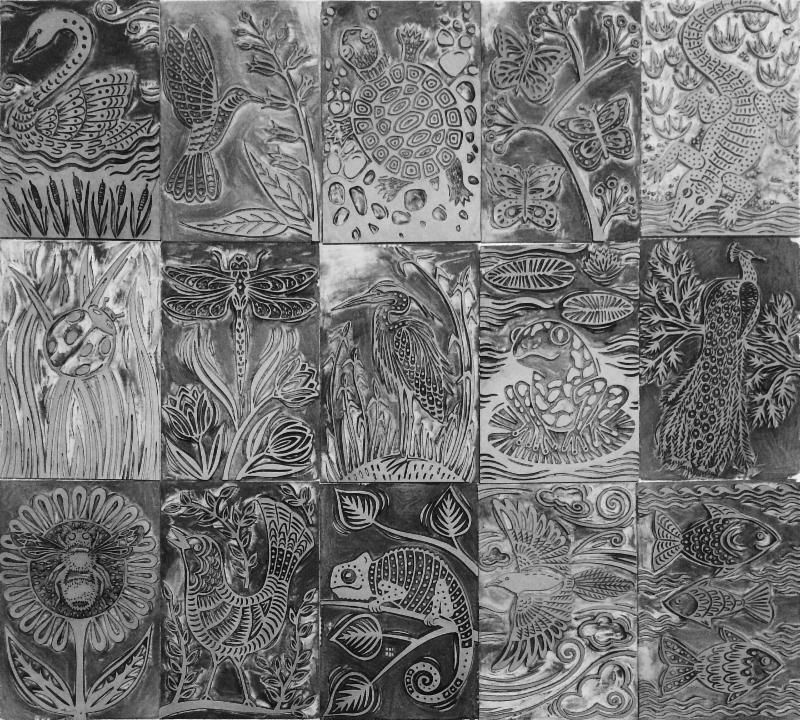 Here is the finished 35 inch long linoleum block! I tried printing with both black and brown ink, but I liked brown best. It suits the image best and is a more natural landscape color. And here is a print reveal photo. I'm happy with how it turned out! It needs a few changes before it gets converted into a full size mural, but I'm glad I decided to make the image into a relief print before tackling such a big painting. Now I feel like I have a good guide for how the mural should look, and a fun print that can be available all on its own!